When you’re trying to make a difficult decision, do you over analyze, or listen to your gut? Do you ever feel like you have a case of the jitters, or butterflies in your stomach, either before a race or an important meeting? 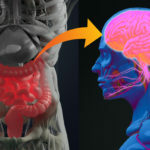 Furthermore, these expressions don’t come out of nowhere; after all, the gut is sensitive to emotion; a range of feelings can trigger symptoms in the gut because the brain and the gastrointestinal (GI) system are intimately connected (1). The trick, however, is first learning and accepting that truly, everything does go back to the gut when we are talking about any aspect of health. It’s much more straightforward to think about this when a more obvious issue occurs; if we have a stomach ache, we’re likely to think back about what we last ate and whether or not that might have caused the problem. But how often are we doing this when we have a more chronic issue? Or more importantly, perhaps, how often are our doctors promoting that conversation? With the exception of someone who’s working with a holistic practitioner or functional medicine doctor, the chances of being asked about what you’re eating during that first visit (or any visit thereafter, for that matter), even when you’re in the office of a gastroenterologist are quite slim. And if you’re not being prompted to think about what you’re eating at all, the chances of learning about the importance of the gut brain axis are slim. Case in point: an article in today’s New York times, which focused on the current methodology involved in treating ADHD in children (2). There have been huge strides in Western Medicine in the past century and there are many cases in which a hybrid of Eastern and modern approaches can have a synergistic approach to treating certain conditions, but at the same time, all too often it is the case that the foundation of our health – what we are eating – is overlooked completely in favor of addressing symptoms with a pill. The title, “When Medicines Affect a Child’s Mind and Behavior” might lead one to believe the the article would integrate some facet of pros and cons to ADHD medications and alternatives with less or even no side effects when compared with commonly prescribed drugs. It goes on to involve mention of one doctor who avoids going right to medications and might suggest cognitive behavioral therapy first as well as the importance of monitoring sleep quality of kids who are being medicated. There’s also talk about how a family might emotionally handle this sensitive topic and the importance of having dosage being closely monitored. Yet in the entire piece, not a single mention of what the child might be eating that could be contributing to, or completely causing the ADHD in the first place, nor their physical activity level. And if they’re spending barely any time moving, and all their free time on devices with screens? Research shows that physical activity sparks real, positive changes in the brain that increase attention and improve mood. What’s more, exercise is an inexpensive, self-prescribed, and accessible supplemental treatment option for adults and children with ADHD (6). Consider the typical American Modern Diet, and consider how the typical American looks today and then compare both to one century ago. Keeping this in mind is one way to easily sift through so much of the nonsense in the media when it comes to the latest pill or powder, the newest trend that just doesn’t seem quite right or the latest magical diet that promises an end to your years of yo-yoing all by counting foods, regardless of where they’re sourced, by a point system. Just think back to what your grandparents, or great grandparents ate. They were not eating items in packages, snacking all day long and finding it hard to get their bodies moving. They ate plants that grew where they lived, fish that swam locally and animals that were hunted in the area in which they lived. Nothing had to be called organic, in season or local because it just was. This was food… and this still is food. Having this simple piece of understanding and knowledge, and keeping it in mind, always, is crucial at developing your own, as well as your family’s optimal eating plan to create health, wellness and well being for a lifetime. Sure, there may be a time and place for modern day meds, but let’s not make the mistake of making that step one and at the cost of skipping over the entire foundation (eating food and moving).